Make a habit of getting a local forecast before you leave the dock! You can listen to the radio, watch the TV, visit the NOAA Website (links below) or use your VHF radio (see info below) to get local updates. On the water, the best way to receive timely weather information is by radio. NOAA Weather Radio provides continuous weather programming for Florida. Although sportsmen may have better luck on cloudy or windy days, being out in a boat in bad weather can be very risky. High winds, rough water and thunderstorms can suddenly turn a pleasant outing into a frightening experience. When you go out on your boat, you should know the current forecast, and have a way to receive warnings and weather advisories while underway. Making boating safety your first priority is the best way to assure you'll be back again for another great fishing or cruising trip! Even with today's high-tech weather forecasts and a radio aboard to receive them, there's no substitute for the time-honored practice of scanning the horizon for changes in the wind, waves, water, and sky that signal developing weather patterns. 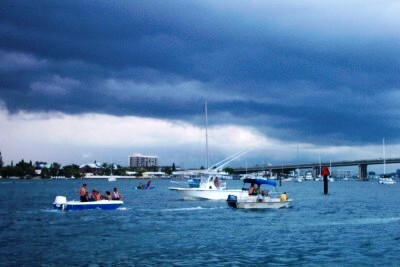 Florida's rapidly changing weather conditions have ruined an enjoyable day for many boaters on our waters. It's always a smart plan to check the local weather and water conditions before leaving for the boat ramp. Take a few extra minutes to check the conditions before you leave. It may save you from a miserable day. A good weather forecast is no guarantee that the weather will be in your favor all day. Occasional storms may appear without warning. Always keep an eye out for changes in the weather, and do not hesitate to head for safe waters. Remember, lighting strikes are a fairly common occurrence in Florida, and may happen several miles away from the nearest storm. Lightning is an electrical discharge between one part of a cloud and another, between two clouds, or between a cloud and the earth. The best protection against lightning is avoidance. Keep a weather eye out for the coppery haze and building cumulonimbus clouds that signal thunderstorms, and head into shore well ahead of the turbulence. Lightning can lash out for miles in front of a storm, and it can strike after a storm seems to have passed. For information on lightning protection, go to NOAA. Deadliest Hurricane: September 17, 1928. More than 2,500 people killed and drowned along Lake Okeechobee when extreme winds sent the lake's waters over surrounding levees. Costliest Hurricane: August 24, 1992. Hurricane Andrew caused $25 billion in damage, mostly in Miami-Dade County. Most Powerful Hurricane: Labor Day, 1935. Winds estimated at 185 mph on Long Key. Highest Temperature: June 29, 1931. 109° F at Monticello. Lowest Temperature: February 13, 1899. -2° F at Tallahassee. Most Rain in 24 Hours: September 5-6, 1950. 38.7 inches at Yankeetown. Greatest Snowstorm: January 10, 1800. 5 inches near mouth of St. Mary's River, along Florida-Georgia border. The purple majesty known as the Gulf Stream courses through the Florida Straits south of Key West and moves steadily northward along the entire east coast of Florida. Like its color, its pace is majestic, a steady 4 knots. It's a mighty tropical river from 24 to 40 miles in width. Its temperature varies from a summertime 86° F off Key West to 75° F off Jacksonville in winter. Weather prediction is not a perfect science. The prudent sportsman won't go out without a weather forecast. But conditions can change quickly, so you must also observe current conditions and be aware of changing weather patterns around you. Any increase in wind velocity opposite in direction to a strong tidal current. A dangerous rip condition may form steep, perilous waves. Thunderstorms are created when warm, moist air rises, cools and condenses. It swells into mounds of thick, billowy cumulus clouds that quickly darken into the towering, ominous-looking cumulonimbus clouds characteristic of thunderstorms. Consider the formation of this thick, dark cloud an unmistakable thunderstorm warming, and head immediately for safe anchorage. The transition from a small cloud into a turbulent, electrified storm front can occur in as little as 30 minutes. Strong, gusty winds and heavy rains with thunder and lightning will soon follow. Fortunately, few squalls last more than an hour. The sharper, darker and lower the front edge of the cloud, the more severe the storm. The anvil-shaped top of the storm cloud points in the direction the storm is traveling. 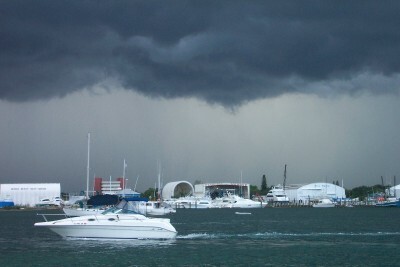 In summer, afternoon thunderstorms are likely to occur over water when the humidity and temperature ashore are high. Hot air radiates upward from land surfaces heated by the sun. Moisture from a nearby body of water is absorbed by the warm air, which rises to begin the formation of thunderheads. They usually appear as swift-moving black clouds, often approaching from the southwest, south or west at speeds of 25-35 knots. You can determine the distance of an approaching thunderstorm by counting the number of seconds between the lightning flash and the thunder clap, and dividing by five. that will give you the distance in miles you are from the storm. For example, if the time lapse between the lightning flash and the thunder clap is 10 seconds, divide by 5. The storm is approximately 2 miles away from you. Some text on this page provided by the U.S. Foundation for Boating Safety.